You don't need to wait for a birthday! 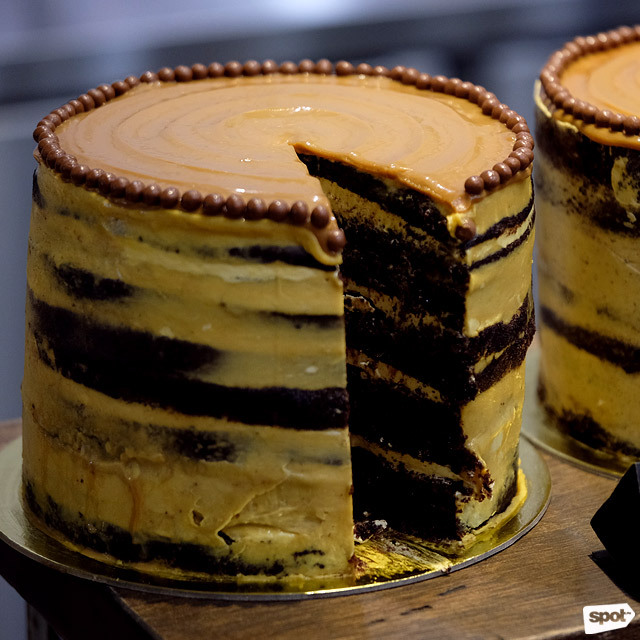 (SPOT.ph) Gone are the days when you could only have cake during your birthday—why should you, when there are lots of bakeries in the Metro with decadent cakes begging to be had whenever you feel like it? 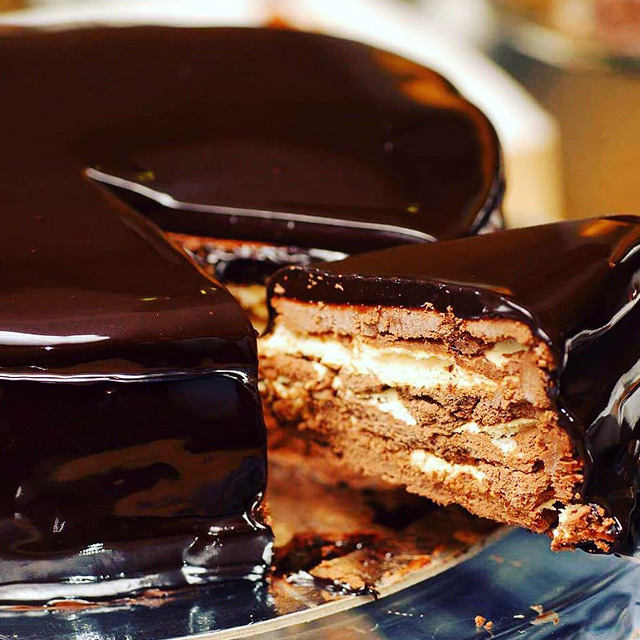 We list some of the best places for ready-made cakes in Manila, and there’s something for every type of craving from simple classics to showstopping layered creations. Before comfort-food destination Nono’s, there was Classic Confections. 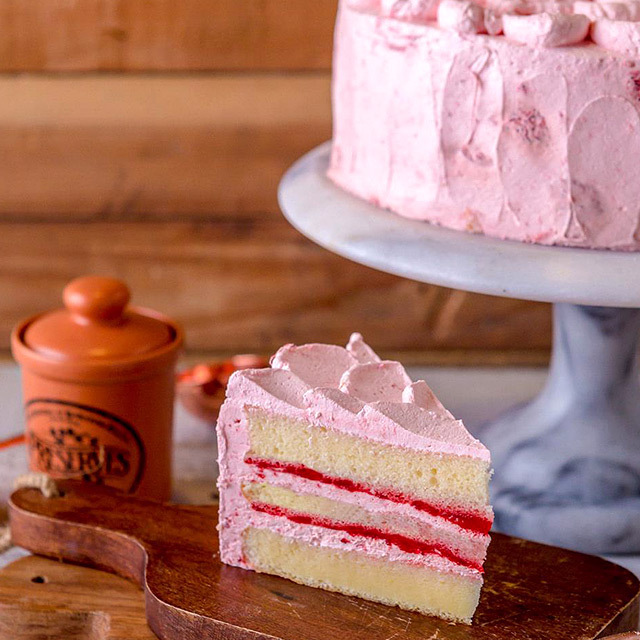 The bakeshop was the brainchild of chef Baba Ibazeta-Benedicto, who offered sinfully delightful cakes inspired by classics but with her own, creative twist. Classic Confections has closed all their standalone bakeshops, but you can still get your sweet fix at Nono’s branches—the wildly popular Nono’s Chocolate Oblivion, a flourless chocolate cake with layers of chocolate mousse and cream filling, and crusted with candied walnuts, is a must-try as well as the Sylvia’s Strawberry Shortcake, which is sweet and tangy thanks to fresh berries. When it comes to the best caramel cake you can get in Metro Manila, Costa Brava easily comes to mind. Costa Brava’s signature Caramel Cake has a light and spongy chiffon-cake base which is then slathered in a buttery, toasty-sweet caramel frosting. While the cake is understandably their bestseller, they also offer other ready-made cakes worth trying like Mango Torte, Sans Rival, and Strawberry Shortcake. Be sure to call in advance to make sure they still have cakes available! 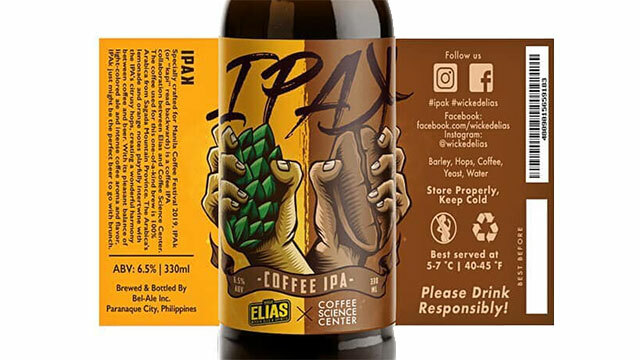 Costa Brava is at 12 Polaris Street, Bel-Air, Makati City. For orders, contact 896-1267 or 896-6872. Katipunan regulars were understandably stunned when Shoppersville was razed by fire in 2016. While the supermarket has yet to reopen, they’ve set up their bakery at their former site—lucky for fans of their marshmallow fluff-frosted cakes. 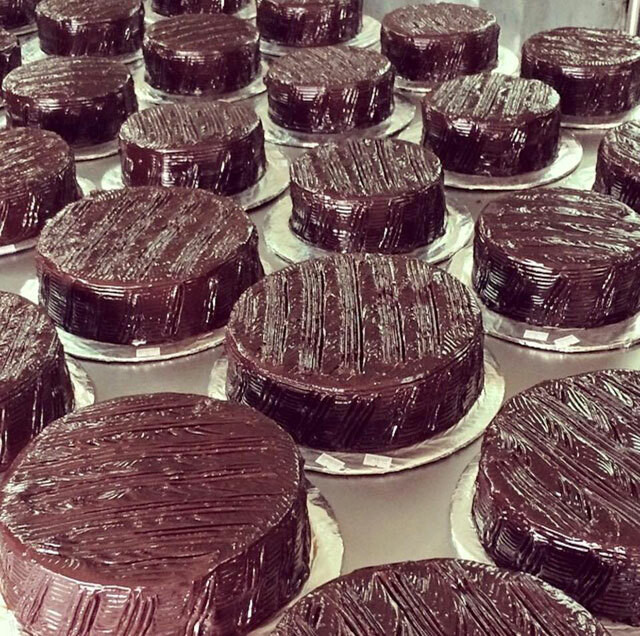 Not many know that you can get different kinds and shapes of classic chiffon cakes at this neighborhood bakeshop, sure to bring back memories of childhood birthday parties. Aside from cakes, you can also get cupcakes, cream puffs, taisan loaf, and more. Shoppersville Bakeshoppe is at 355 Katipunan Avenue, Quezon City. 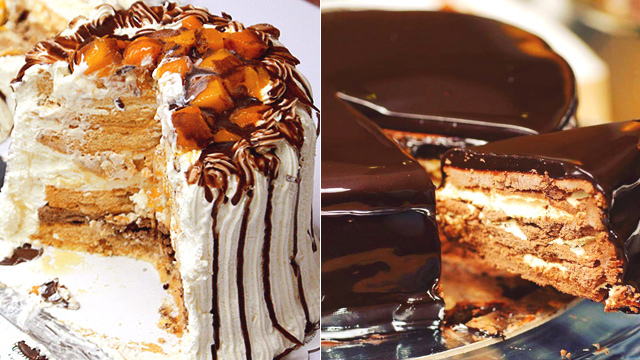 Conti’s is, of course, best known for their Mango Bravo, the tall, luscious cake of wafers, chocolate mousse, mango cubes, and cream that is a headache to slice but is so worth it. But the bakeshop also has other equally delicious cakes you shouldn’t skip: At your next party, have the Turtle Pie, with a chocolate crust topped with caramel, chocolate cream, walnuts, and whipped cream that’s sure to be a hit. If you’d rather go the fruity route, have the Banana Dream with layers of banana cream, vanilla sponge, and mocha mousse that’s drizzled with caramel syrup. 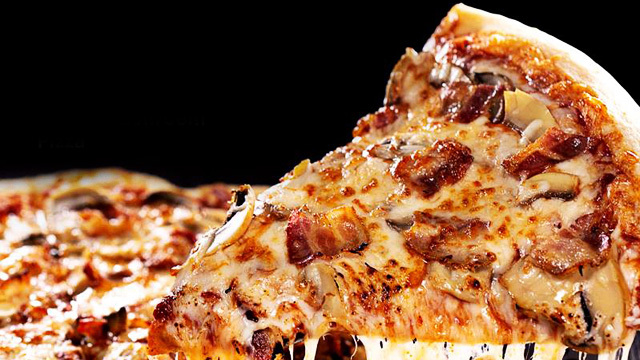 See a list of Conti’s Bakeshop and Restaurant branches. 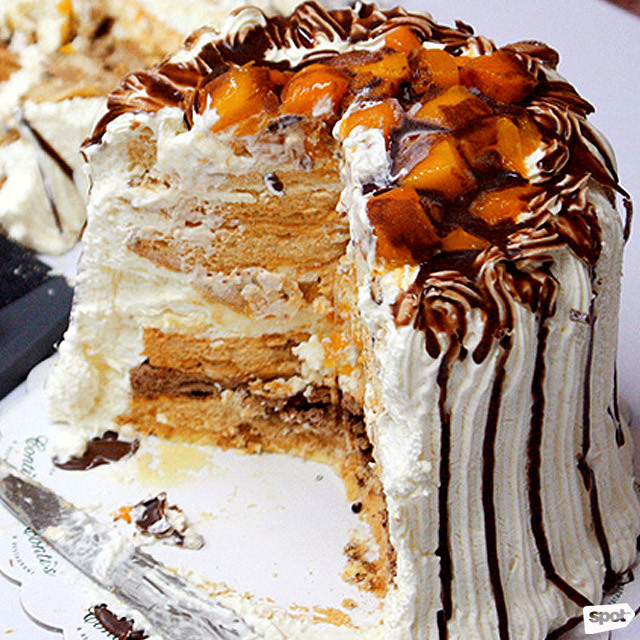 Not many think of cakes when they think of Dulcelin, but those who do know that their Mango Torte, with chewy nougatine, sweet ripe mangoes, and cream, is one of Manila’s best. Aside from the Mango Torte, you can’t go wrong with anything from their extensive dessert menu. 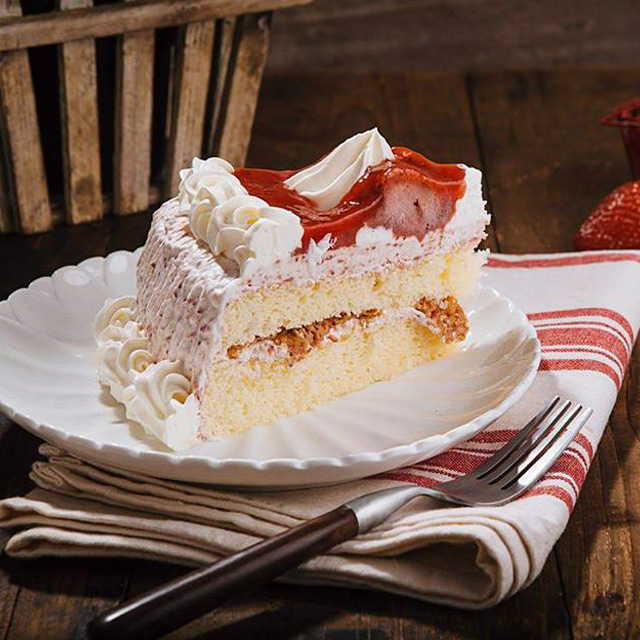 They have the Strawberry Cake, chiffon covered with fresh strawberries and cream and the Irish Cream Flan Cake, with an Irish cream-infused cake topped with a sweet caramel flan. Dulcelin is at 2 West 4th Street, Quezon Avenue, Quezon City. From a home bakery called Fudgies by Jenny S., Sugarbee has now grown enough to have three stand-alone branches. Their most famous cake is the Salted Caramel Cake for good reason—it’s hard to resist a decadently moist chocolate cake with a thick swirl of caramel frosting and just the right sprinkling of salt crystals to elevate its sweetness. Sugarbee also offers a classic Sans Rival which you can also get in chips form as well as chewy, bite-sized alfajores. See a list of Sugarbee branches. The Workshop at The Grid is the playground of pastry chefs Miko Aspiras and Kristine Lotilla. Their cakes are unlike any you’ll see anywhere else, like their line of 17-Layer Cakes: Their luscious 17-Layer Chocolate and Salted Caramel Cake has alternating layers of Valrhona-Chocolate cake and salted-caramel cream, while their 17-Layer Strawberry Shortcake has fresh strawberries and soft vanilla cake. The Basque Burnt Cheesecake, with a light-as-air cheesecake base and a toasted caramel top, is another must-try. The Workshop is at The Grid, R2, Power Plant Mall, Rockwell, Makati City. Magnolia Bakery, or M Bakery as they’re known in the Philippines, may have become famous for their signature buttercream-frosted cupcakes and banana pudding, but they also have some of the most gorgeous cakes you can get in the Metro. 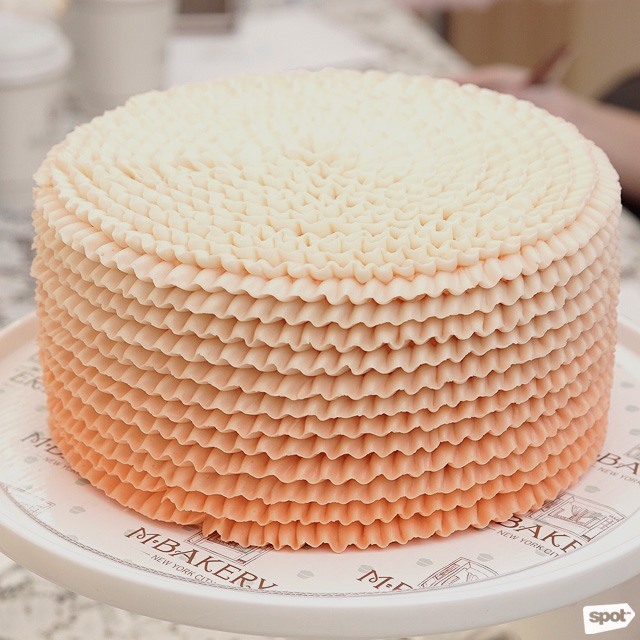 Think impeccably frosted cakes in the prettiest pastel gradients. You can choose from classics like Vanilla, an old-fashioned classic that’s rich and buttery, or the fudgy Chocolate. 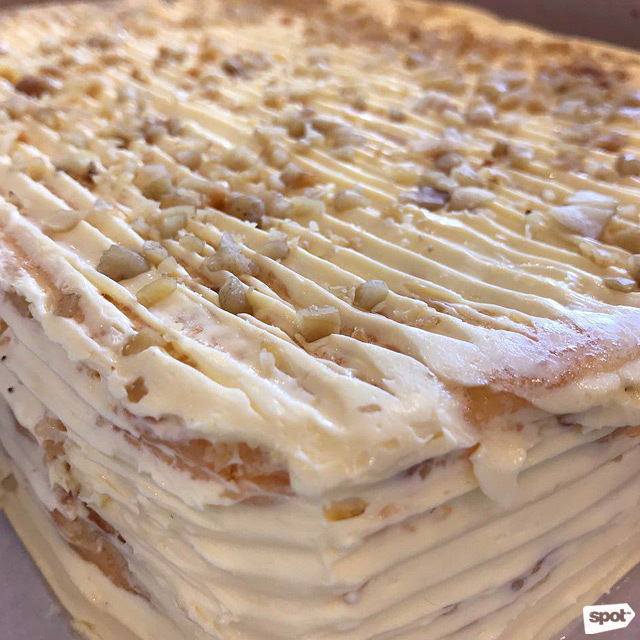 There are also specialty cakes like Carrot, Coconut, or Hummingbird with a butter cake studded with pineapples and pecans and frosted with cream-cheese icing. M Bakery is at G/F One Bonifacio High Street Mall, 5th Avenue, Bonifacio Global City. Trust the Japanese to create a cake that's impossibly delicate and exquisite. 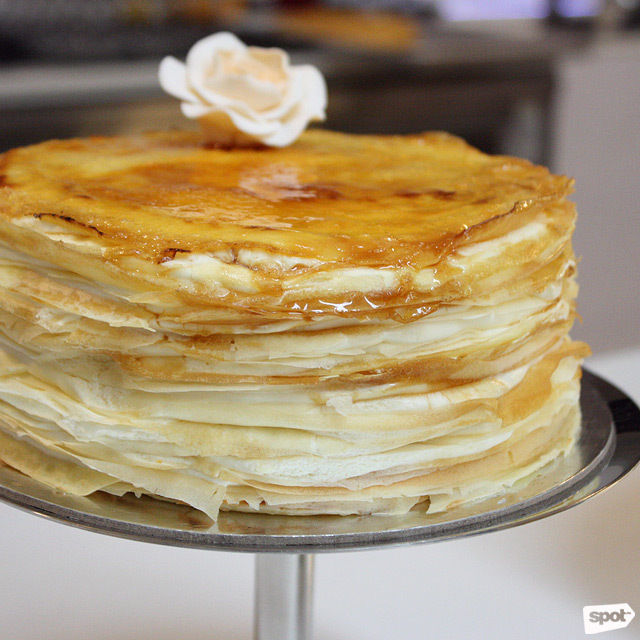 Paper Moon Café from Tokyo is best known for their Original Mille Crepe, named such because of at least 20 paper-thin layers of crepe held together by cloud-like pastry cream. Paper Moon also regularly comes out with different variations of their best-selling cake like a Mango Mille Crepe and a Black Forest Mille Crepe. See a list of Paper Moon Café branches. Aside from being a brunch favorite, Wildflour is also a reliable go-to for some of Manila’s most decadent cakes. There’s their Salted Chocolate Cake, which has consistently made it to the top spot in SPOT’s top 10 chocolate cake list for the perfect balance between rich chocolate frosting and a light and airy cake, with a light sprinkling of salt crystals for an added oomph. 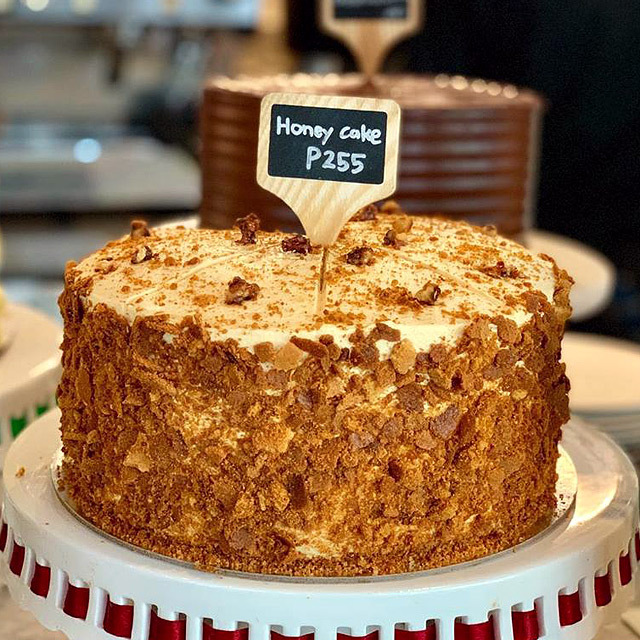 Their Honey Cake is also the ultimate cheat-day treat, with a honey cake covered in a thick layer of dulce de leche frosting, cake crumbs, and toasted walnuts. See a list of Wildflour branches.